The Living Mall is a downloadable Landmark Building for SimCity 4 Rush Hour/Deluxe, released as the Plugin Pack 002 free Downloadable Content. It is a recreation of Core Pacific City in Taipei, Taiwan as it appeared in 2003. The News Ticker fluff entry created on its placement is "Core Pacific City Living Mall Has A Life Of Its Own". Due to a commenting error in the original LUA file, it may or may not appear in gameplay. The way The Living Mall was made by Maxis is different to most of the other landmarks in that its daytime renders take advantage of embedded Alphas, something common to BAT models, however it doesn't utilise dedicated nighttime renders, instead using the Shade then Overlay method used by all Maxis buildings. It shares this trait with 63 Building, Sungrye-Mun and Kunjungjon. 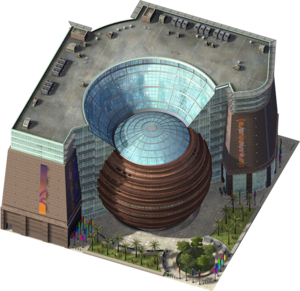 The Living Mall also features in-render semi-transparency, allowing objects to appear behind the model. It is utilised on the high awning seen in the above image. This is the only Maxis object known to have this.